I wasn’t expecting to like Sheryl Sandberg’s tome, “Lean In: Women, Work, and the Will to Lead” chronicling the female paradigm of “not leaning in.” We’ve all seen it, if not been active participants of this female tendency. In my past life, I attended business meetings where I would avoid front and center. Girls do it every day as well, not raising their hands for fear of seeming too smart. Of course we aren’t all guilty of such behavior but many of us are and the behavior starts young. Is it genetic? Men are risk takers, women play it safe? Tons of research has backed this up. Sandberg does a good job of playing these scenarios out in her book; she even shares how she called out female executives guilty of this behavior at a business meeting. 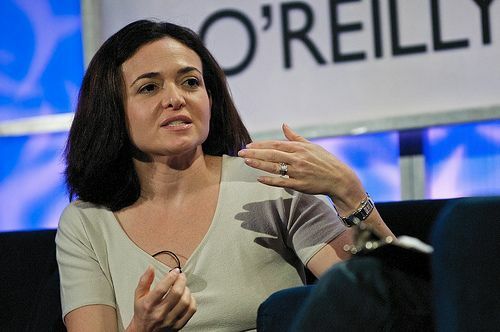 Sandberg, chief operating officer of Facebook, doesn’t stand alone but she doesn’t have much company among the top ranks in business. This is what moved her to write her book. She had me at the story of how large she was when she was pregnant and suggested parking for pregnant employees. Come on, if men were carrying humankind, wouldn’t they have their own parking? She encourages women to ask for what they need. Despite her Harvard provenance, Sandberg is relatable and comes across as genuine. She shares snippets of her life that are not all sugar coated. I enjoyed learning about her mother and grandmother. She admires her mother, who was a stay at home mom and champions her volunteer work. I also feel that she doesn’t condemn those who have chosen to stay home to raise children. She doesn’t advocate for a one size fits all approach. She tells it like it is which is that often women hold back and create their own glass ceiling. At first glance, it seems as though women are once again being blamed for the problem. To her credit, she’s decided to do something about it. Truthfully, the book was an undertaking she didn’t need to add to her already impressive resume. She’s also started an online movement, allowing women and girls to share their stories. Her goal is to create a global community dedicated to encouraging women to lean in to their ambitions. Women have heard this before but kudos to Sandberg for talking about it and encouraging dialogue. The whole “what would you do if you weren’t afraid” message she promotes via her online community is a good thing. I personally feel that American women have spent a lot more time combatting each other than challenging their own internal dialogue or battling corporate America. Yet, I’m not optimistic that she will have more company at the top any time soon. I like Sandberg’s message and I love that more women and girls are challenging themselves but corporate America and government policies need to meet us half way. Small changes like workplace flexibility, daycare subsidies, maternity leave are lacking – and by the way should be considered family issues not just women’s issues. I predict that the younger generation and women like relaunchers will set their sights on entrepreneurial options that provide leeway for family life and other personal needs. The book is still a good read, especially for younger women; there are some great quotes and tips for the new graduate.